This is one of those reviews where I have to start off with expectations. I was underwhelmed with the first weekly Avengers event, No Surrender. My whelms were dropped even lower by Marvel's last weekly story in Uncanny X-Men. So I opened up No Road Home prepared, possibly even eager, to be disappointed. Instead, I had an absolute blast. This is a formidable comic. If your budget only has space for one Avengers book, this one should be your top priority. #1 starts with a glorious bit of high comedy. It's Hercules trying to help the NYPD with a super-powered disturbance in a hardware store. He gets distracted telling tales of the glory days of Olympus. When a cop finally prods him into action, he discovers the culprit is some sort of "militarized dog," AKA Rocket Raccoon having a customer service dispute. Yes, we start with the fully-satisfying tale of "When Hercules Met Rocket," and things just get better from there. This is a beautiful comic from the first page to the last. The art team lays an incredible amount of detail into the all-star cast. It's not just the costumes and poses that look terrific, either; the heroes' expressive faces do a powerful job of tying the art into the emotions carried in the dialogue. The colours are driven up to 11 on the saturation scale, as is usual with this experienced set of collaborators. They're almost garish, but the way the plot develops suggests we're headed into much darker territory, literally as well as figuratively. These bright shades may be the last hurrah before endless night takes hold. "Endless night taking hold" is the core plot point for this issue. New pals Herc and Rocket are just the first heroes to experience unscheduled nightfall; the same phenomenon will reach out for Hawkeye & Scarlet Witch, Vision & Spectrum, in fact, for the entire universe. And that night comes for Bruce Banner, too. Maybe the biggest advantage this story has over No Surrender is that it comes after an all-time great run of the Immortal Hulk. Whereas the Hulk's appearance in the previous event was a drawn-out exercise in frustrating foreshadowing, now we instantly know how unbelievably dangerous it is to push the ideas of Bruce Banner and "endless night" together. "Night is his time," we whisper. And even this first little taste of the Immortal Hulk wedged into an Avengers team - a team that includes Clint Barton, no less - is horrifyingly great. Sterling character work is the rule rather than the exception here. The writers have assembled a greatest hits line-up of established character arcs that deserve more page time - not just Hercules and the Hulk, but also the dying Vision and the romantically-satisfied Scarlet Witch. They're all graced with highly compelling writing; even if the crisis du jour was a loser (and it isn't), this series would be worth following just to learn more about how the stars' lives are going. Herc's meandering stories about the Good Ole Days on Olympus circle back around to become a sledgehammer by the end. 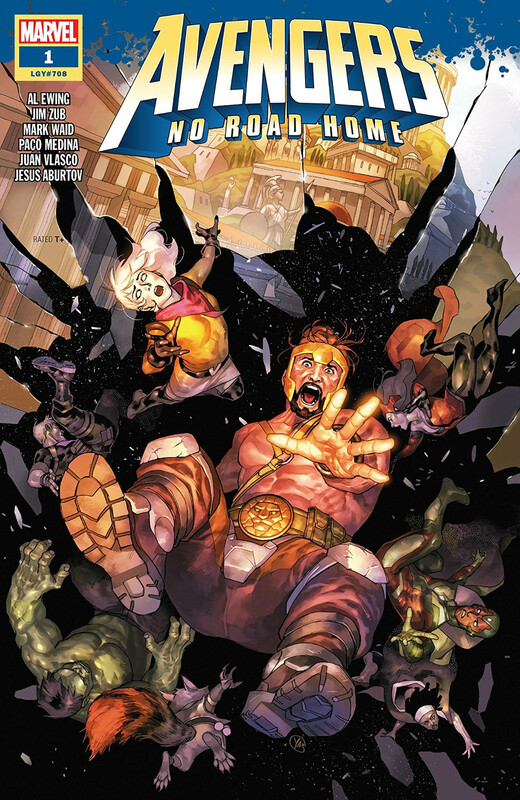 This is an Avengers story, but it's also very much a Hercules story; he is going to be the lynchpin as the event goes on. I'll resist the temptation to recount the whole plot because it is a terrific ride you should take for yourself. But this initial issue does a perfect job laying out the scope and nature of the problem (if anything, this is an even bigger crisis than No Surrender) and introducing the villain responsible. Far from being a cash-in sequel, Avengers: No Road Home kicks off with a virtuoso case of premise refinement. The key problems of No Surrender - too-big cast, too-slow pace, too-blah villains - have been corrected with surgical precision. This story roars out of the gate with passionate characters, a clear (and dreadful) antagonist, and simply gorgeous storytelling in words and art. Time will have to tell how the story ends, but it absolutely could not be off to a better start. One bad thing about team-written books: I don't know who to congratulate for nailing Herc's lovable bombast in the first scene.